Five Day deli-busy office bldg Central San Diego location- $400 rent! Want a Deli/café with free rent? Sorry, that is not going to happen, but buy this café /deli and you come pretty close! This is a very well equipped five day deli/cafe in the heart of San Diego’s Mission Valley. Rent is $400 per month! That is not a typo; $400 per month even includes trash, water and utilities. Current owner has health issues that must be dealt with or this place would not be for sale. Time is now to take advantage of this great opportunity. Restaurant is located on the first floor of a large commercial building, elevators, stairs and mailboxes are immediately out the deli’s front door. It is hard to come to work in this building and not notice the daily specials and longtime favorites that this deli offers. Location literally can't be missed by the other tenants and their customers. Walking distance away are many other commercial buildings filled with customers who always looking for their next good meal. 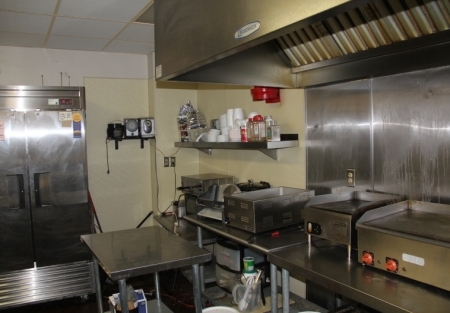 The kitchen is ready to continue current concept or add nearly any menu items you would like. 7 foot hood system covers griddles, steamer and small oven. Grease interceptor is in place. Health department loves this restaurant. Cold prep table facing front counter makes for easy andefficient operations. Espresso machine, ice tea and coffee brewers allow for great mix of beverages. New Clover POS system is in place along with security monitors. Wan to be home for dinner every night? This Deli/Café is ready for an operator to come in and make this place their own. Originally established in 1998 this deli has great staying power and support from the building tenants. Add a little consistency and some marketing and this place could be a huge money maker. Previous owner had stated gross monthly sales in the 14-16k per month range. Restaurant space is approximately 1000 square feet with lots of great outdoor seating areas. Current lease expires in October of 2020 with a five year option available. visit sellingrestaurants.com for the name and address of this deli. Cheapest rent you will find!